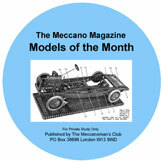 From 1956 to 1962 the 'Model of the Month' series featured regularly in the Meccano Magazine. These covered a wide variety of new "set" (normally No. 8 or larger) and non-set models. A general description and photographs of the model were included in the Magazine article, and a supplement, containing detailed building instructions and a parts list, was available on request. Other models, designed and described by "Spanner", were also published between 1968 and 1975 in a similar format. All 38 'Models of the Month' and 4 popular 'Spanner' models are on the CD. For each, the magazine article and supplementary material have been combined and reset. Scanned from original leaflets at 300 dpi in .PDF format, suitable for on-screen viewing or printing, with cover picture index for easy overview and selection. For PC or Macintosh. Ref: MOM Price: £19.95 (Also available as printed, individual leaflets: ModelPlans, or as a single bound volume Meccano Models of the Month).